Yesterday's barbeque team had a very successful day at Bunnings at Mile End netting $1000.00. It was great to have our newest member Margie join us, plus Christine and club stalwart David Rowe. Thank you to John Wotherspoon for organizing an excellent day at Monarto Zoo. We enjoyed the tour and an excellent picnic. It was lovely to have Andy, Christine, Heidi, Katey and Liz's friend Di join our club members. Last Thursday morning four of us met for a Coffee Conversation at the Velo which included David Rowe. Sadly, David's current circumstances prevent him from attending our morning and evening meetings. Last Friday, I represented the club at the Norwood club’s bbq. at Bunnings at Mile End as they were one short and we will receive $96.00 for my shift. I plan to induct Andy and Christine into the club at this coming Thursday morning breakfast meeting which is exciting both for them and the club. The Club's Board meeting is to be held this coming Thursday immediately after our breakfast meeting. As mentioned, our next meeting is at the Ibis this coming Thursday morning. Come along and enjoy breakfast with us! If you have a passion for "serving the community", our Breakfast Club would like to welcome you to one of our meetings. If you are a visiting Rotarian from interstate or overseas, we would love you to visit us. We meet for breakfast on the first and third Thursday of each month (7am for a 7.15am start) and have an evening meeting on the fourth Wednesday of each month (6.15pm for a 6.30pm start). Our meetings feature either entertaining guest speakers or the planning and review of our various service projects. Those who are able also meet informally on the second and fourth Thursday of each month for a "Coffee Conversation" at 9:30am at "Velo", a coffee venue under the old grandstand at Victoria Park. If you are interested in coming along to a meeting to see what we do and meet our other members, you can just show up, but it is probably wise to contact us first by email, at membership@rotaryadelaidelight.org. United in the spirit of Service we value truth, fairness and friendship; and we welcome the opportunity that Rotary gives us to contribute our talents and resources in support of others. To be recognised as the Service Club of Choice in the Eastern Precinct of Adelaide because we are a Friendly Breakfast Club that appeals to a broad range of busy people who want to make a difference to local and international communities. Since the Rotary Club of Adelaide Light was chartered on 12 June 1986, three members have been elected to the highest District position - that of District Governor - overseeing the needs of the 40-50 autonomous clubs within District 9500. For a club that is 29 years old, it is pleasing that we have welcomed members with the commitment, vision, Rotary values and ethos of "Service Above Self" who have sought to serve as District Governors. Our first member to seek office was our club's Charter President District Governor 1993-94 Anthony (Tony) Reade; followed by District Governor 2005-05 Katina Jones; and then John Campbell 2014-15. Adelaide-born John Campbell spent his first three years in Cummins, Eyre Peninsula and returned to Adelaide to attend Adelaide Boys High School where he joined the Interact Club (sponsored by the Rotary Club of Adelaide). He then joined Rotaract in 1971 and held Club Board and District positions. While working in Port Pirie, he joined Apex and in 2000, John joined the Rotary Club of Adelaide Light and was President in 2011-12. John worked in the financial services industry including his own insurance agency and, later, financial planning practice. John has been an active member of several financial adviser associations and was admitted as a Life Member of the Million Dollar Round Table (now Premier Association of Financial Professionals) where he was SA Chair from 2004-2009 and Australian Chair for 2010-2012. PDG John's wife, Julie, was a Rotary Exchange student to Belem Para in Brazil in 1971 and later joined the Rotaract Club of Edwardstown including a stint as Club President. Julie became a member of the Rotary Club of Adelaide Light in 2014. In the 1990s, Katina recognised the need for a development and training centre focusing on a sustainable future in a rapidly changing world, thus founding EQUALS International Pty Ltd. Twenty years on, EQUALS International has been established in Asia, Europe, Americas, Africa and the Middle East. As a successful business owner, Katina’s passion for industry-driven vocational education and training, continues to motivate her to make a difference in the vocational education sector and workplace. 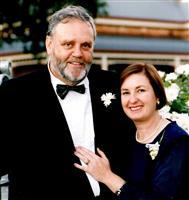 Katina joined the Rotary Club of Adelaide Light in 1996 as their first female member. Katina was elected as District 9500's first female District Governor during Rotary's centennial year of 2004-2005. Among other appointments, Katina has served on Australia’s Executive Committee for UNIFEM (United Nations Development Fund for Women), Cancer Care, TAFE SA, Voices for Women and as a Rotary International training leader - training incoming District Governors from around the globe. For 20 years, Katina has represented Australia at the Commission on the Status of Women at the United Nations in New York and more recently was appointed as a delegate to the United Nations Permanent Forum on Indigenous Issues. Tony Reade joined the Rotary Club of Adelaide in 1985 and was involved in the formation of the Rotary Club of Adelaide Light, being Charter President of the new Club - the first breakfast club in District 9500 - in 1986-87. Tony undertook many District committee roles before being elected District Governor for 1993-94. He innovated many changes to the annual District Conference that saw a marked increase in attendees - over 800 attendees. When he moved his city-based business, he transferred to his local club of Walkerville (where his wife had been a Rotarian since 1990) including taking on the Presidency in 2002-03 before transferring back to the club of his heart - Adelaide Light - about six years later. PDG Tony's wife, Yvette was President of the Rotary Club of Walkerville in 2004-05, transferred to the Rotary Club of Adelaide Light in 2006 and was elected President of Adelaide Light for 2014-15. PDG Tony was awarded the Medal of the Order of Australia on 25 January 2011 for 40 years of service to the community particularly through Toc H Australia, Rotary International and as Councillor (and Acting Mayor) of the City of Walkerville. Tony was awarded an Honorary Membership of the Rotary Club of Adelaide Light on 5 June 2016.